Calling Low Dale, Off Lathkil Dale, Youlgreave. Unfortunately this rock shelter is on private land with no public access. Calling Low Dale a tributary dale of Lathkil Dale is an overgrown and silent lost world off one of the Peaks most popular riverside walks. In the Neolithic it was used as a burial site and two cists were constructed within it, one containing human bones, arrowheads and a Peterborough ware bowl. Colonel Harris who excavated here in 1936-39 also found other burials outside the cists. Above: Calling Low Dale upper. 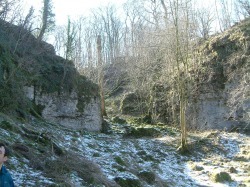 The rock shelter is below the limestone butress in the left of the photograph. 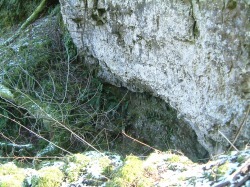 Below: The shallow overgrown rock shelter.